The Office of Ecumenical and Interfaith Programs is happy to announce that we are opening spots for our Interfaith Scholars Program. This is a co-curricular program for UIndy students that will build their interfaith and religious literacy and give them exposure to interfaith leaders and experiences. Enhance their knowledge of a variety of faith and/or philosophical traditions. Engage in a specialized experience of interfaith dialogue, engagement, and service. Be mentored by a UIndy faculty member. 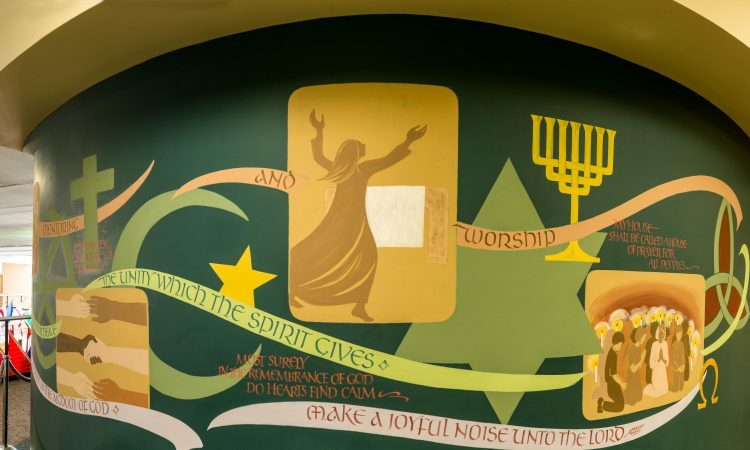 Work collaboratively with a group of religiously diverse peers to plan and execute events that engage the wider campus community in interfaith engagement and cooperation. All interfaith scholars will receive a yearly $500.00 stipend for their participation each year. paid for by the Office of Ecumenical and Interfaith Programs. The current class of interfaith scholars has attended national conferences of the Interfaith Youth Core in Chicago and the Desmond Tutu Center for Peace in Indianapolis. They have produced events on campus such as the 9/11 Vigil and the Interfaith Winter Festival, engaging many UIndy students, faculty, and staff in interfaith cooperation and service. All interested students, including graduate students, are welcome and encouraged to apply. Scholars may elect to continue in the program throughout their tenure as students at UIndy. Please note: The program seeks to include students from a variety of faith or non-faith backgrounds. Membership in or identification with a religious faith is not required. Applications are due by Feb 26th at 11:59pm. If you have any questions, please contact Rev. Arionne Williams (williamsa@uindy.edu) or Cindy Sturgeon (csturgeon@uindy.edu) in Ecumenical and Interfaith Programs, SC203.